This month we’ve highlighted the stories of amazing women who have made a difference in the U.S. Capitol and Congress. Today’s post will bring to light the impact of one woman who literally carved out a place for herself in American history by sculpting an iconic statue of the women’s movement that is displayed in our “national stage,” the U.S. Capitol rotunda. Adelaide Johnson always had an aptitude for art and the dramatic. Born Sarah Adeline Johnson on September 26, 1859 in rural Illinois, she changed her name to Adelaide in her early adult years because it had more flair. After studying during her teen years at Missouri’s St. Louis School of Design, she financed a trip to Europe through a $15,000 insurance settlement received after falling down an elevator shaft in Chicago’s Central Music Hall. Johnson studied for the next 11 years in Italy. 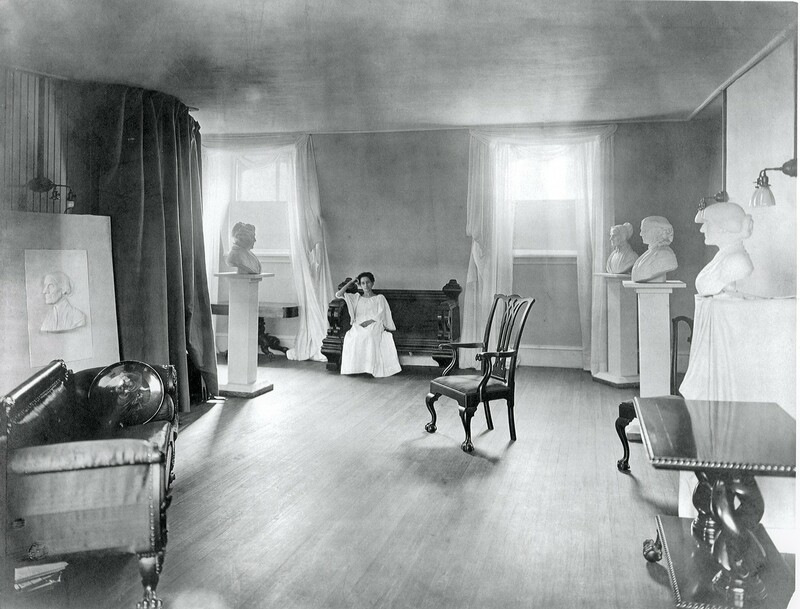 Mrs. Adelaide Johnson in 1921, the same year her Pioneer statue was first dedicated. She returned to the United States and began sculpting a bust of one of her personal heroines, Susan B. Anthony, a prominent leader of the women’s suffrage movement. Upon its completion, Anthony herself suggested Johnson create the busts of two more sister suffragettes, Lucretia Mott and Elizabeth Cady Stanton. Together the busts would be displayed in the Women’s Building at the World’s Columbian Exposition in Chicago in 1893. Johnson, in keeping with her flair for the dramatic, actually used the busts of these women to serve as “bridesmaids” in her wedding to Alexander Frederick Jenkins in 1896. Jenkins took his wife’s last name as “the tribute love pays to genius.” The marriage would last for twelve years then end in a bitter divorce. Johnson received a commission from Alva Belmont of the National Women’s Party to create a monument to the leaders of the suffrage movement. 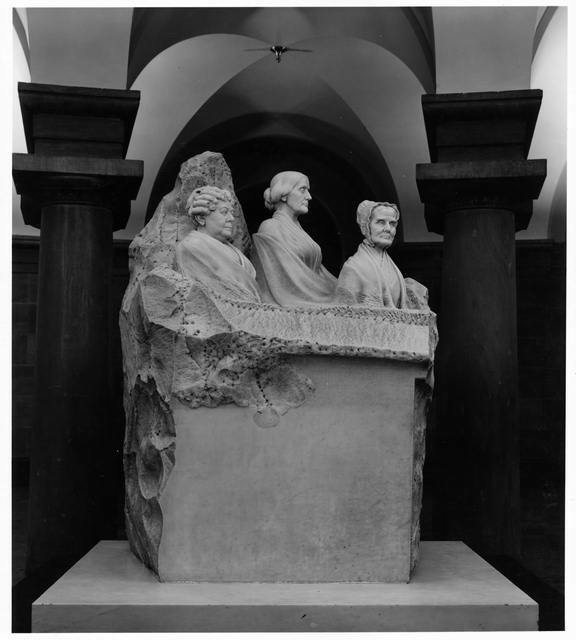 Memorial to the Pioneers of the Woman’s Suffrage Movement was unveiled in the U.S. Capitol Rotunda on February 15, 1921, the 101st celebration of Susan B. Anthony’s birth. The overall look of the statue appears unfinished – with an uncarved marble block in the back left and a rough exterior. 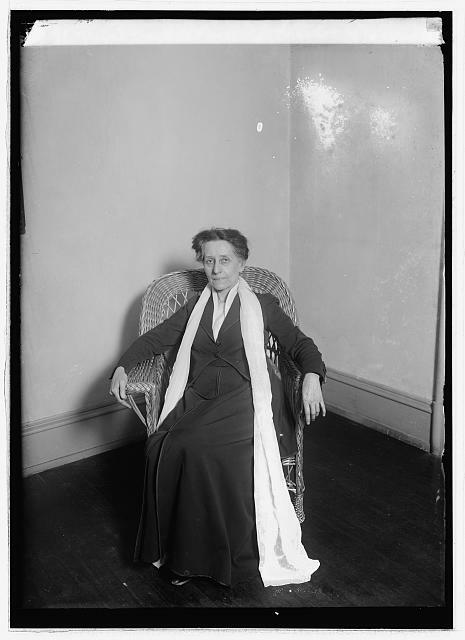 Johnson wanted those who saw her monument to the women’s suffrage movement to remember that the work of women gaining equality wasn’t completed with the passage of the Nineteenth Amendment. Shortly after its dedication it was moved to the crypt (the floor below the rotunda) where it would remain for the next seven decades. After raising the $75,000 necessary to complete the move of the 14,000 pound statue, the “Raise the Statue” Campaign successfully brought Johnson’s memorial back to its place of honor in the rotunda. Today it stands proudly among former presidents and national leaders as the only statue of women in the room. Adelaide Johnson died in Washington, DC on November 10, 1955 at the age of 96. She is buried at the historic Congressional Cemetery in DC. A to Z of American Women in the Visual Arts. Carol Kort and Liz Sonneborn. 2002. American Pantheon: Sculptural and Artistic Decoration of the United States Capitol. Edited by Donald R. Kennon and Thomas P. Somma. 2004.